In A Hurry? Here's A Quick Summary Of The Porter Cable Jigsaw Review. This Porter Cable jigsaw can go up to a max of 3,200 SPM due to a powerful 6 Amp motor and it also features Porter Cable signature 7 speed lock on dial and 4 stroke orbital action mode. Model PCE345 has a tool free blade change for effortless transitioning from one blade to another and comes with official Porter Cable warranty. 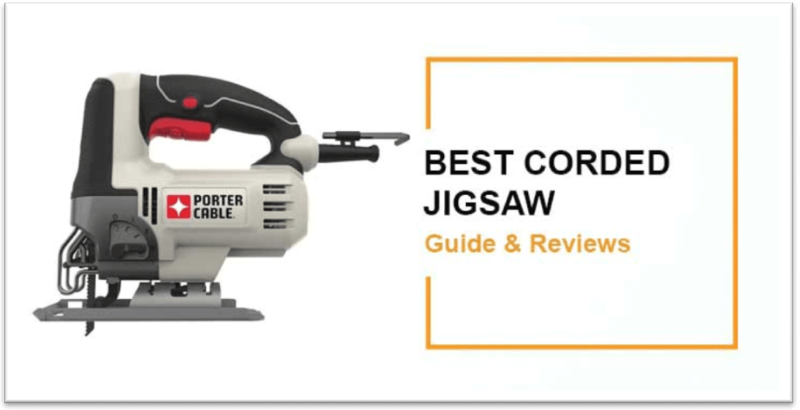 This corded jigsaw is definitely recommended for users who wish to get by with satisfactory results in a wide range of challenging woodworking projects. 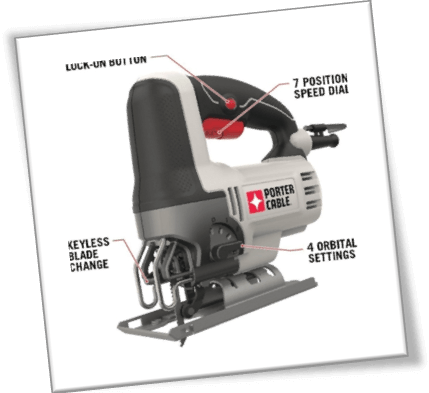 Porter Cable power tools are not exactly a priority on my list, but I do love to review them. Part of the reason is associated with the affordability factor. They make cheap products for beginner to intermediate level users. Period. 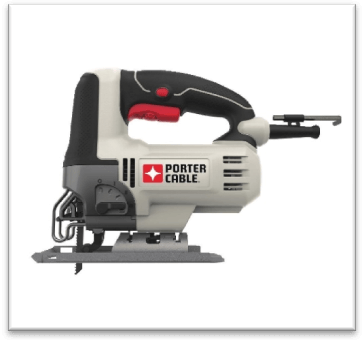 Today, I am reviewing Porter Cable PCE345 Jigsaw. It was released back in 2014, but since then, the Porter Cable jigsaw has gone through many renditions. Porter Cable made it a more stable product, with a range of options that were earlier introduced at the time of the first release. The major difference is that the latest model of the aforementioned jigsaw incorporates a flawless execution of usability that would have been otherwise a hassle during the first year or so. On the same note, Porter Cable power tool manufacturers are completely aware of the demand bracket where these products fall in. I.e. you do not expect too much, but at the same time, you will not regret if the PCE345 Jigsaw malfunctions for whatever number of reasons. How to Use Porter Cable PCE345 Jigsaw Orbital Action Efficiently? A lot of reviewers have overstated by saying that the Porter Cable PCE345 Jigsaw is the “best” jigsaw for the money, but I beg to differ. I bet half of these so-called reviewers haven’t even purchased the power tool for that matter; maybe they said so from preselling perspective. In reality, it doesn’t work that way. 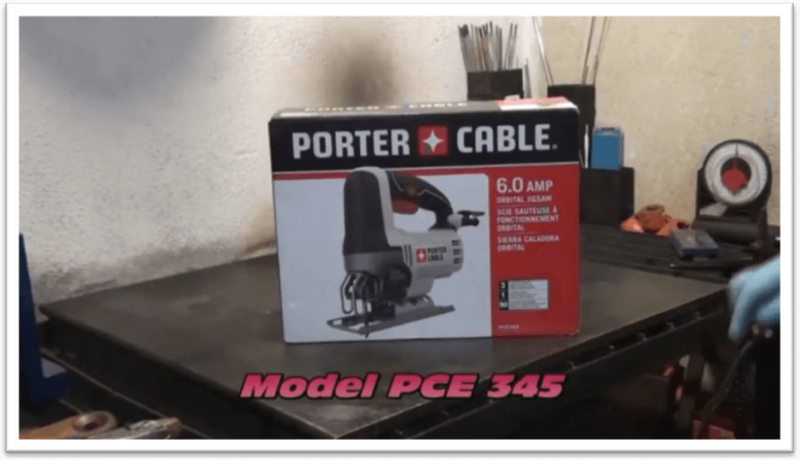 If you are a professional or and intermediate level woodworker to say the least, you know that the Porter Cable PCE345 Jigsaw is not the best cutting tool out there. As a matter of fact, I’d classify it as a suitable power tool for entry level DIYers and mediocre users who don’t want to sweat about overspending too much on one particular product. Having said that, the company is completely aware of the range of jigsaws and Porter Cable circular saws they have been releasing. For people who “blame” Porter Cable for releasing substandard products, they should know that the manufacturers are doing so to meet the demands of budget conscious users. In that sense, Porter Cable’s approach is good – i.e. to make something for an everyday type of woodworker, but there are a lot of improvements to be made. Porter Cable PCE345 Jigsaw is no exception. However, this jigsaw offers two unique features, which I have rarely seen in other company power tools. They introduced a seven-step blade speed dial and an orbital dial to help meet the demands of users who go beyond a conventional work piece types. You can cut through aluminum, PVC pipes, oak wood, pinewood and many other things without any hassle. It was made possible with the help of the 4 speed orbital blade oscillator and the 7 speed blade speed dial as installed in the jigsaw’s handle. In theory, orbital action is supposed to help towards adaptation of cutting motion of the jigsaw. Newbies usually make the mistake of assuming that orbital mode and speed dial are the same thing. No, they are entirely different, and help to address two different range of blade motions. Orbital action is more like a pendulum. It assists the blade in oscillating between two extremes, ranging from minimum oscillation to maximum oscillation as per the requirement of the woodworker. The reason why orbital action is important is because of how the blade affects the cut material. Not all work pieces are the same; some of them are dense, for which you need 1, 2 orbital mode selection. Whereas, thinner work pieces call for full range of orbital action. This allows the Porter Cable PCE345 Jigsaw blade to take full advantage of the cutting capabilities of the product itself. You could even make plunge cuts, which are the hardest to master in my opinion. In addition, orbital action also helps the blade to cool down faster. It minimizes the wear and tear factor in that way. Since the range of motion is free due to orbital modes, the blade gets more room to catch the “air” as it works its way through the work piece. In my previous jigsaw reviews, I did not go into lots of details explaining optimum orbital action performance. However, since this one involves Porter Cable jigsaw, which is a rather cheap product, I figured that we need to talk about orbital action in more details. This will save you the hassle of misusing the blade and the jigsaw itself in the long run. As stated earlier, the general rule of thumb is to keep the orbital action selection on extreme when cutting thin material. Likewise, if the material is dense, keep the setting on an all time low – medium. Regardless, I’d rather see you starting with very low orbital action speed with the Porter Cable PCE345 Jigsaw and then moving up as needed. The result will reflect in nicely cut smooth pieces without any jagged edges or whatsoever. This action is also important when a woodworker is making an effort to make fast hassle free cuts. Thick pieces of timber require several re runs of a saw, until the blade final reach across the other end. In this context, it doesn’t matter which jigsaw, circular saw or chainsaw you are using on PT lumber. These pieces are usually very big, and if your blade halts somewhere in the middle, it is not entirely your fault. You just need to keep it slow and re-run the blade as many times as needed. The question, however is, whether or not it is important to select the right orbital action for Porter Cable PCE345 Jigsaw. No, it isn’t. But if you are doing what's needed, the cuts will be very smooth, and you will also end up adding more value to the jigsaw’s life. For Metal: In case of metal, Porter Cable PCE345 Jigsaw’s orbital action won’t matter much as opposed to your control. You need to exercise more power and focus on where the jigsaw is going. Of course, the orbital action will help, but control is more important because metal is extremely resilient in that sense. As a matter of fact, it would be better to keep the orbital motion selection dial on first setting. It’d also be better if you can just turn off the orbital action completely, rather than sticking with the lowest setting. The reason has to do with unwanted vibrations that the orbital motion itself produces. Since my Porter Cable corded jigsaw made the sheet to bob a lot, I turned off orbital action for metal and near metal made mats. For Aluminum: This material is relatively easy to cut through. During the testing phase, the Porter Cable Jigsaw blade did not pose any issues/ challenges. Just to be on the safe side, please select a low setting. For Plastic: This is relatively easy for any jigsaw to cut. Plastic PVC pipes and such category sheets don’t cause any problem for as long as the thickness is suitable for the jigsaw blade. Still, if you want to be on the safe side, set the Porter Cable orbital action selection to 1 or 2 before jumping to the extreme side. Given that the jigsaw is having no issues cutting through plastic, you can pause and increase the orbital action for suitable results. The lowest speed dial setting on Porter Cable PCE345 Jigsaw is the safest one. At most, the blade will halt, but you can increase the speed later and start over. With speed dial settings, you get more room for practice. Understand how Porter Cable jigsaw works at different speed settings. Right off the bat, the jigsaw weighs around 5 – 6 Lbs. This is relatively lightweight as compared to Bosch JS470E and Dewalt DCS331M1 jigsaws. Porter cable introduced a 6 Amp motor for an average SPM of 3,200. They also installed a speed dial and orbital mode selection in the jigsaw for optimal results. As mentioned earlier, the speed dial is made for those woodworkers who seek perfection in their cuts. Likewise, the jigsaw’s orbital setting takes it all to the next level with edge-to-edge smooth results. 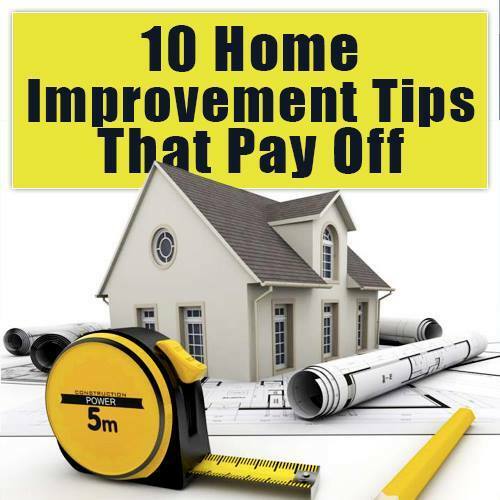 The product is suitable for woodworkers who are just getting started on DIY projects, and intermediate skill contractors who are looking to buy a rather expensive substitute after a few months or years. Model PCE345 Jigsaw is a fault free product. As long as you know what you are doing, you can crunch out exceptional performance without any hitches. Ergonomics wise, Porter Cable integrated a bulky over molded grip on the handle. This helped me in grabbing the Porter Cable jig saw with a firm grip. Since control matters a lot in the end, the grip assisted in helping me to move the blade in exact direction where I wanted it to do. Cheap jigsaw with little or no major issues. Comes with official Porter Cable warranty. Features Porter Cable signature 7 speed lock on dial and 4 stroke orbital action mode. Can go up to a max of 3,200 SPM due to a powerful 6 Amp motor. Tool free blade change for effortless transitioning from one blade to another. This jigsaw does not have any onboard blade storage compartments. The trigger is installed in close proximity to the speed dial. You need to position your hand a little lower so as to not mess up with the selected speed settings. As compared to their other products, Porter Cable PCE345 Jigsaw hails with some worth trying features. The fact that the jigsaw itself is super cheap, you won’t regret buying it for casual use around the worksite. In that sense, the Porter Cable jigsaw is definitely recommended for users who wish to get by with satisfactory results in a wide range of challenging woodworking ideas and projects.